Reserva Ecológica de Guapiaçu, Atlantic Forest, Brazil. 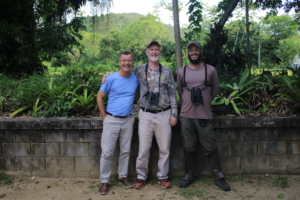 Last week REGUA received Igor Camacho in the company of Ian Thompson, Conservation director for The Nature Conservancy, Brazil to successfully see the Shrike-like Cotinga amongst many local specialities. Ian’s stay provided us with the opportunity to discuss our own objectives and plans. We understand that most International agencies prefer providing funds to establish parks in Partner countries as opposed to supporting local NGOs buying land. The former takes a fraction of the cost but on the other hand, NGOs understand the importance of engaging at local level, with their local communities, providing employment and raising awareness, all as a result of their own personal commitment. Though decreeing parks is an important step taken by Governments, often those areas become “paper parks” allowing occupation, hunting and farming to continue. Nature’s protection can be hard to enforce in these situations and NGOS are squeezed out of their stewardship role.